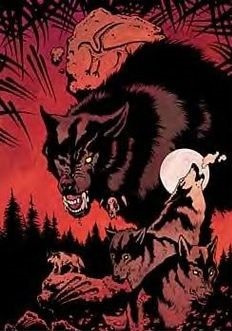 Once again we look at how I’d reinterpret a tribe from the Werewolf the Apocalypse role-playing game. Now we turn to one of the most controversial tribes: the Shadow Lords. Werewolf tribes generally fall into one of two categories: the “traditionalists” (such as the Silver Fangs and the Get of Fenris) try to cleave as much to the old traditions as possible, generally continuing their stewardship of a particular ethnic strain of humans while the “modernists” (such as the Glass Walkers and the Children of Gaia) embrace more progressive ideals and generally are no longer connected with any particular ethnicity – it has been many centuries since the Glass Walkers considered themselves a specifically Greco-Italian tribe, and even longer since the Children of Gaia felt any particular association to the legacy of Sumer and Babylon. But the Shadow Lords do not easily fall into either category. They do still associate themselves with a particular ethnicity (that of Eastern Europe and Western Asia – the lands below Russia), but not to the same extent as their rivals the Silver Fangs, and they do maintain their old traditions… while also being interested in new ones. In all things they stand at the crossroads, between the dark and the light, the old and the new, the devil and the deep blue sea. They claim to be pragmatists, realists, choosing whatever tools would best get the job done. Their enemies call them “opportunists,” people who would betray their own packmate and totem if they thought it would get them a little ahead of everyone else. The history of the Shadow Lords is entwined with that of the Silver Fangs. While the Silver Fangs were the lords of northeastern Europe and northern Asia, the Shadow Lords ruled southeastern Europe and the Middle East. The border was always shifting as both tribes pushed back and forth. They defined themselves by being each other’s opposite – the grand Silver Fang chieftains and shamans who would announce their presence to the heavens, and the much subtler Shadow Lord strategists and seers, who would be as quiet and unexpected as a sudden shadow. Their totems were spiritual rivals: great Eagle who was confident in his rulership of the north and wanted the whole world to see him strike and subtle Stormcrow who took every opportunity he could find, and was never too proud to eat the eyes of the dead. This rival continued down throughout the ages to the modern time, and it is the firm belief of many Shadow Lords that one of the big reasons that the Garou are losing is that they have relied on antiquated Silver Fang leadership for so long. Is the best tactic really to follow the orders of a tribe who gets most of their insights from insane shamans writhing and gibbering in their yurts? From a tribe who still venerates, as one of their greatest champions, Genghis Khan? This is not an age of barbarian hordes and howling berserkers. This is an age of skyscrapers and business meetings, of electronic communication and cutthroat deals. This is the future. Change or die. The Shadow Lords also disdain the regular codes of honor. To them the ends justify the means, and to pretend otherwise is self-indulgent and foolish. If becoming the board members of a corporation can save a rain forest, if striking a deal with some local vampires can preserve the Spirit Realm — hell, if killing a mere three innocent people saves a thousand, then do it. The Silver Fangs may be willing to walk into oblivion and take the whole damn world with them rather than sully their lily-white hands, but not the Shadow Lords. They’ll save the world, from itself if necessary, and if sacrifices must be made, so be it. Do not be Eagle; be Crow. Get the goddamn job done. The Shadow Lords do their best to work well with everyone, as everyone can be useful. In particular, they try to be supportive of all the non-Silver Fang tribes in order to get them to support the Lords over the Fangs. However, they are often despised by such traditionalist tribes as the Fangs, the Get, and the Red Talons. The Glass Walkers and the Bone Gnawers are some of their closest allies, and in fact the Shadow Lords are some of the few Garou that treat the Gnawers with respect (only a fool throws away a tool that has many uses, and besides, Crow can respect people who speak with the spirits of the streets). The Children of Gaia have a complicated relationship with the Lords, respect the Lords’ willingness to engage in alternative viewpoints, but not comfortable with their ruthlessness. The Shadow Lords, master deal-makers, have also forged numerous allegiances with various non-Garou. Their ties to the Corax are long and respected, and they also often deal with vampires, wraiths, mages, and numerous sinister roving spirits. No potential ally is ignored. Whatever it takes, they’re going to make sure Gaia wins the war. C. S. Lewis is one of my favourite authors and I’ve always loved his Chronicles of Narnia. So, for the curious-minded, here is how the Narnian dwarfs (as Lewis spelled it), might work as a dwarven subrace in Dungeons & Dragons 5th edition. There is much that can be said about the dwarfs of Narnia, both good and bad. It is said that there have been no creature created by Aslan who is more cunning and more skilled… and (with the possible exception of humans) more vulnerable to corruption. Dwarfs value hard work, craftsmanship, pragmatism, and loyalty above all, especially loyalty to kin and kind. Dwarfs pride themselves on their practically and “down-to-earth” nature. They have no interest in pomp and ceremony, court manners and whatnot. They prefer to be blunt, forward, and get the job done as efficiently as possible. This explains their skill in archery. Most Narnian human nobility are knights who favour melee combat with sword and lance. Though these folk recognize archery’s importance on the battlefield, they consider it less honourable and heroic than facing the enemy in direct melee combat. Dwarfs have no such qualms, and are cheerfully willing to shower their enemies with arrows before they get anywhere near them. As a result, the archery units of Narnian armies often consists mainly of dwarfs and yeoman (who don’t follow the knightly code), and the occasional woman (who also is not bound by the code). Most dwarfs recognize any other dwarf as a like-minded individual, cut from the same stone (metaphorically), more alike than any human, faun, or talking animal could ever be. That isn’t to say that dwarfs feel no loyalty to non-dwarfs – many do – but everything else being equal, a dwarf is likely to take a fellow dwarf’s side in an argument, and few things will enrage a dwarf more than the notion that his “people” aren’t being treated fairly. As a result, dwarfs generally prefer to live with other dwarfs, often with three, five, or seven dwarfs all sharing the same cavern or cottage. Some rare dwarfs will share a home with non-dwarfs, but they are the exception rather than the rule. It is no secret that of all the non-human races created by Aslan, dwarfs are the ones most likely to fall from grace. Some find their industriousness warped to greed and pride, others care so strong about the dwarf race that they turn against all others, and some become so coldly utilitarian that they will willingly work for any side that seems to be treating them fair enough – whether dark king, wicked witch, or demon. Narnian dwarfs are divided into two kinds. Red dwarfs have red hair and beards as soft as fox fur, whereas black dwarfs have black hair and beards as tough as horse hair. Red dwarfs are generally friendlier than black dwarfs, more willing to associate and even befriend non-dwarfs, whereas black dwarfs are far more suspicious and bad-tempered, often believing that the only kind of person a dwarf can trust is another dwarf. Though black dwarfs are more likely to go astray than red dwarfs, there have certainly been bad red dwarfs and good black black dwarfs. Either the child of a dwarf and a human or the descendent of people who were. Most half-dwarfs were born after the Telmarine Invasion, when many dwarfs disguised themselves as humans to avoid the purges. Many dwarfs (especially black dwarfs) despise half-dwarfs, both for not being “pure” dwarfs and because their very existence reminds people that their ancestors chose to deny their dwarf identity (something utterly repugnant to most dwarfs). With the rise of King Caspian X, much of the dwarfen prejudice against half-dwarfs is decreased. With the exception of alignment, red and black dwarfs have identical statistics. 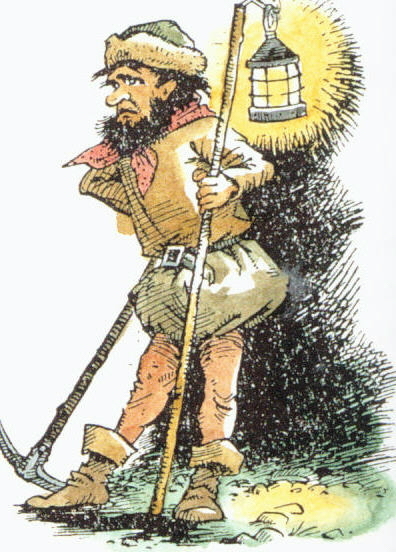 Dwarf: Narnian dwarfs have all of the traits of regulars dwarves. Alignment: Dwarfs value laws, tradition, and orderliness, and are almost always Lawful. Red dwarfs, relatively friendly and easy-going, are generally Lawful Neutral or Lawful Good. Black dwarfs, however, are more likely Lawful Neutral or Lawful Evil. Ability Increase: Your Intelligence score increases by 1. Fell Archer: You have proficiency in shortbows and composite shortbows. If your character class already gives you proficiency in those weapons, then you gain +1 to hit with them. 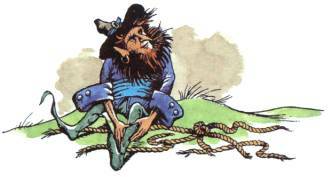 Unrelenting: Narnian dwarfs need less rest than others do, and if necessary can march all day and all night. You only need to rest for 15 minutes to gain the benefit of a short rest (rather than an hour) and sleep for 3 hours to gain the benefits of an extended rest (rather than 8 hours). Tomorrow I teach the third installment in my “Writing for Graphic Novels & Comix” class as part of Langara College’s “Graphic Novel & Comix” program. It’s an honour to be one of the program instructors, and a really exciting experience to be teaching people how to best organize their ideas, develop their story, and convert it into a comic script. Many people say that often the instructor learns as much about the subject as the people he’s teaching, and it certainly true that preparing each class has made me think long and hard about the steps for creating a good story and a good comic, including character motivation, the arc of a plot, and the composition of a comic page. It will be fascinating to discover how I feel about all of this at the end of the final class, and also what comic stories my students will produce. It has been an exciting adventure so far. Continuing my changes to Werewolf the Apocalypse. As far as the Red Talons are concerned, only they are pure, only they are still untainted by man and civilization. They list all the sins of humanity, all of the creatures that have died because of them, and they remember. They remember them all. The Red Talons make them their totems. Their tribal totem is Smilodon, the great sabre-tooth cat that once ruled the land before it was cut down by humanity with their tricks of technology, but they have made totems of all the great ones: the Spotted Lion, the Woolly Mammoth, the Dire Wolf, the Auroch, the Cave Bear, all who have perished by the hands of man. Generally any largely Red Talon pack will follow an extinct totem, most likely a predator, making sure to honour its spirit. Any proper Red Talon refuses to serve a “tainted” totem, which is any based on a mythical creature (such as Unicorn or Pegasus) or especially an animal that has been urbanized, such as Rat, Coyote, Cockroach, or Crow. Red Talons consider such totems to be corrupted at best, traitors at worse. I previously revised the Silver Fangs of Werewolf the Apocalypse to be more shamanic, now here is the Get of Fenris revised to have a much more legitimately Nordic approach to gender. Few tribes are as misunderstood as the Get of Fenris, partly influenced by their fearsome reputation and partly because the loudest members are often those who are least connected to their heritage. Though they are most often perceived as the “Scandinavian tribe,” their bloodline runs through all Germanic peoples, and many of them are descendant from Visigoths, Ostrogoths, Angles, Saxons, Franks, etc. Thus, many Get come from Germany, the Netherlands, Austria, England, and even France, not to mention North America. 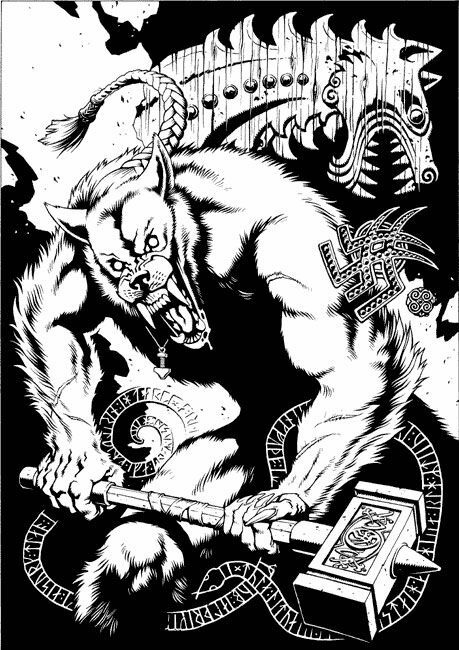 A lot of the stereotype of the Get as a blustering, macho, sexist braggart comes from young people of Germanic descent discovering they are “Nordic werewolves,” and not having a clear idea of what that means, thus falling on Viking cliches. Nordic, Swedish, and Danish Get are often much more restrained and “proper,” and when possible try to set their wayward relatives straight. Their mythology is similar to the Norse pagans, but different in several key points. In fact, they believe that the Norse followed a corrupted version of their own. According to the Get, the Earth was not created from a dead giant, but is a still-living giantess: Jord, the Mother of All, a being who is also Yggdrasil, the World Tree. Chief among Jord’s children was Nerthus, the first woman to practice seidhr, the art of the shaman, and who was the first priestess of the Vaneir, the original inhabitants of Scandinavia. Nerthus and her people were dedicated to protecting Jord from the forces of Niddhog, that monstrous dragon who is constantly gnawing on the World Tree, and who other people call the Wyrm. The Vaneir worshipped numerous beings, including Jord (the Earth), Sol (the sun), Mani (the moon), and Fenris (the Lord of War, greatest enemy of Niddhog), and certain Vaneir were selected by Fenris to join with his children, producing the original werewolves. Eventually a new group of humans entered Scandinavia from Asia, fleeing the destruction of Troy. The Vaneir called these Trojans the “Aesir,” which means “men from Asia,” and Njord, high chief of the Vaneir welcomed them into his land. He and the Aesir chief, Othin, traded many gifts and made promises of peace. However, Othin was hungry for knowledge and respect, seeking to learn all the secrets of heaven and earth. He seduced Freyja, daughter of Njord and the greatest seidkonur, learning from her secrets that were meant for women’s ears alone, and he impressed many of the Vaneir with his own magic tricks so that they worshipped him as a god greater than Fenris or even Jord. This enraged many Get of Fenris, and they battled against Othin and his sons, but neither side could win, and eventually a truce was reached. Both the cult of Othin and of Fenris could be allowed to co-exist, and both could preach their creed, and they both would work together against the forces of Niddhog, and the Get would sail with the Norse as “berserkers.” But in punishment for daring to learn seidkonur, Othin must let Fenris tear out his left eye – which the sorcerer agreed to. Still, despite this truce, the cult of Othin and the Aesir eventually overshadowed Fenris, and many Get of Fenris felt that they had been tricked by the Cunning One. But as the Get worked with the tribes of the Norse to battle the forces of Niddhog, including his dragons and giants (later called the “Fomori”), so in the end Fenris is content. The Get’s totem is, of course, Fenris Wolf. 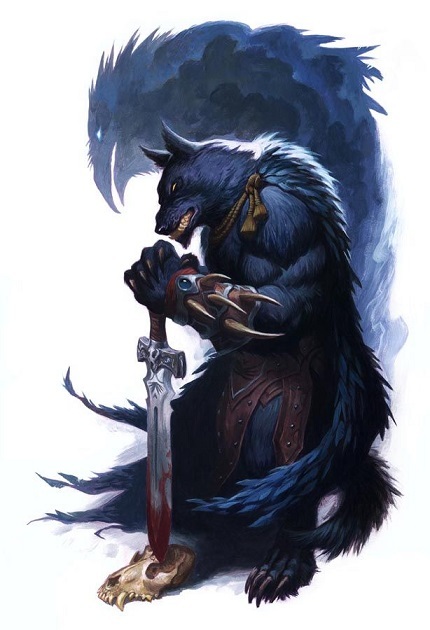 They believe themselves to be his descendents – he was the first wolf, embodiment of Jord’s rage against Niddhog, Jormungand, and all the monsters that threaten her. She produced Fenris to battle the monsters, but was horrified to discover that he was too powerful, too savage. He kept on growing and growing, destroying everything in his path, and Jord feared that soon he would devour Sol and Mani, and then her. So she bound him, bound him with chains he could not break, until Ragnarok, when he would be released against her enemies. The Get know themselves to be Fenris’ children, and to have his rage within them. They know that his rage need to be unleashed against the enemies of the Earth, but also that it must be controlled or it will get too out of control. Their godi often lecture them on the importance of balance, their skalds sing of it. Many Get have an image of the bound Fenris Wolf that they keep at their side and often study to remind themselves. Perhaps more than any other tribe, the Apocalypse is a defining part of Get ideology. Many say that it was a Get, the greatest seidkonur of them all, who first prophesied the End Times, telling her tribe that they must prepare for it. And the Get have. They are dedicated to not only being great warriors, but also great explorers, for if they are to have a chance at Ragnarok, they need all the knowledge and resources they can. Those who die in battle go to Valhalla, to build the army of spirit warriors, those who die through exploration go to Hlesey, but those who die of accident, sickness, or old age go down to Nifelheim, the land of ghosts and cold. It is said that nothing frightens a Get more than this “straw-death,” and once they feel their strength fade the final time, many Get will fling themselves into one final battle, determined to take out as many enemies as they can so that Valhalla will open its doors for them and they can help their gods prepare for Ragnarok. The Get’s relationship to gender is complicated. The traditional view is that Jord, the Earth, created male and females with particular purposes in mind. The males are closer to Fenris, and Fenris’ rage, while the females are closer to Jord and her insight. Thus, warriors are meant to be male and seers female, and as the chiefs were expected to be warriors, most chiefs are male as well. Other roles (such as skalds and tricksters), have always been considered more gender-neutral. Certain Gets’ comments on “women warriors” (as well as the behaviour of the younger, often non-Scandinavian Get, who are revelling in their new-found “macho-ness”) have given the tribe a reputation for sexism among many other Garou. However, very few respectable Get have any issue with female warriors or even female leaders, certain almost none actually born in Scandinavia. Norway, Denmark, Sweden, and Iceland have had female leaders for a very long time. Besides, there have always been females who have been filled with rage and taken the battle to the enemy. For many more traditional Get, the far more concerning thing is male theurges, or “seidkonur” as they call it. The secret ways of seidhr were taught by Jord to her “daughters” — and for a long time were often considered the province of females and females alone. According to Get legend, males who practice seidhr are very vulnerable to the temptations of the Wyrm, easily corruptible by desires for power or forbidden knowledge. It is interesting that an unusually high percentage of Get born under the crescent moon are female, and those that are male frequently have a difficult time. Though it is no longer technically illegal for males to practice seidhr, the few males that do often have a hard time earning the trust and respect of their tribe. As a result, many become distant and resentful of their tribe, sometimes attempting to join another one more accepting, such as Children of Gaia or Uktena, or even falling to the Wyrm. Though many Get chiefs are men, this does not mean that all the power is within his hands. The leader is often a large and powerful male, but when he talks, there is almost always a female (possibly two) sitting behind him, frequently in the shadows – sometimes knitting. During some conferences, she will say nothing, but at others she will rise to her feet, shuffle over to the chief, and whisper in his ear. He will listen, and almost always do what she says. It is a poor chief who ignores the voice of the gods. Berserker, “Warrior” (Ahroun). What one thinks of when the word “Get” is mentioned. More berserkers are male than female, but female ones are far less suspect than male seidkonur. Young bersekers often dream of Valhalla, eagerly leaping into battle. Skald, “Storyteller” (Galliard). Those who know the teachings and stories of Jord and who pass them on to others. Alcohol is a prominent part of their rituals, and many skalds make sure to get a little tipsy before getting to work. Mead is traditional, but many skalds use other kinds. In addition to grand sagas of battle and glory, skalds love indulging in puns and word-play (especially kennings), and frequently engage in spontaneous insult competitions. A skald unable to quickly unleash a level-three kenning insult on the spot really isn’t much of a skald. Godi, “Priest” (Philodox). Those who make sure everyone is following the ways of Jord. Seidkonur, “Seer” (Theurge). Those who commune directly with Jord and her spirits. Usually female. It is considered “unmanly” for a male to practice Seidhr. Ratatosk, “Trickster” (Ragabash). An unusual tribe for the Get, and the only one named after a mythological being (the squirrel who runs up and down the World Tree) rather than a societal role. They are there to shake things up. The Get of Fenris have a complicated relationship with the other tribes. As traditional neighbours to the Silver Fangs and Fianna, they have had frequent clashes, but also treaties and trade, and in the end those are probably the tribes that they relate to the most. The Get take serious issue with the Silver Fangs’ claim that they “rule the north,” and have frequently been offended by the pride that the Silver Fangs take in their male theurges. Many a Get seidknour has lost her temper over a male shaman lecturing her on how to approach the spirits. That said, the Get of Fenris also largely accept the Silver Fangs as their general leaders – not the best choice, but better than the others. The Get have always respected the Fangs, even when they didn’t want to admit it – in ancient times, the Norse refused to raid east of Scandinavia because they feared the mighty witchcraft of the green-eyed “Finns.” The Fianna haven’t yet forgiven the Get for stealing France and England from them, and some Fianna kinfolk still dream of “Arturios” driving the Angles and the Saxons out, but they do recognize how much they have in common, especially with regards to the importance they place in music and personal honour. Interestingly, many Get like Black Furies; they find it refreshing to have another tribe in which almost all seers are women. Many seidkonur enjoy going for long walks with Black Fury theurges. But in the end, it’s the Uktena that make the Get the most suspicious. A whole tribe of shamans and witches, at least half male, is something that makes the Get really uncomfortable, and their willingness to embrace people of any culture shows a disturbing lack of traditions. The more charitable Get think that Uktena are watering down their ways to nothing, while the more suspicious ones believe that the tribe as a whole may be becoming corrupted by the Wyrm. So anyway, here are some thoughts on a reinterpretation of the Silver Fangs as a tribe dedicated around northern Asian shamanism, who consider themselves to be the great shamans of the Garou Nation. The Silver Fangs claim they were the first – the first wolves that learned how to wear the skins of men, the first to invoke the powers of the spirits, the first to speak with the Earth-Mother. It was the Mother’s messenger, the Eagle, who appeared to the first shaman, and showed him how to travel up the World Tree to the bosom of the Mother, and how to travel down with the secrets to teach the others. And the place where she kissed him became silver, as a sign of her favour. The Silver Fangs trace their lineages through the people of Russia, Siberia, and other parts of northern Europe and Asia: the Slavs, Sami, Finns, Turkics, Evenks, Mongols, and more (they take great pride in Genghis Khan). They are the people of the Ice, the Reindeer, the Horse, and the Steppes, but most importantly they are the people of the Eagle and the Falcon, for those were the heralds of the Earth-Mother and those are the forms that the Silver Fang shamans take when they fly into the Umbra. Silver Fangs call their theurges “shamans” and often get quite scornful when other tribes apply that term to themselves. 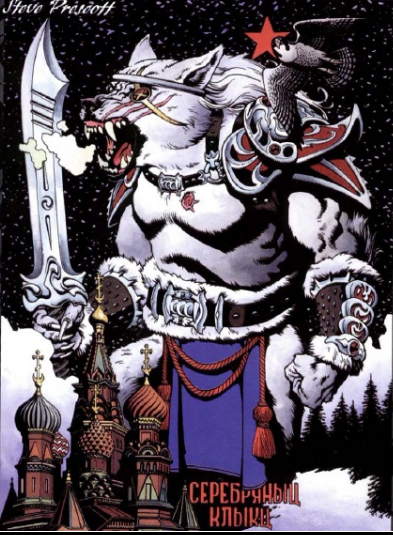 After all, it is a Russian term, from the Evenki, and the first shaman (or so they claim) was a Silver Fang. All others are pretenders. Though shamans are rarely alphas, sept leaders, etc., this is mainly because most Silver Fangs feel the shamans have better things to do than lead. After all, they must keep their minds on the Goddess and the words she whispers in their ears. However, when a shaman speaks, all Silver Fangs listen. A Silver Fang chief would be foolish in the extreme if he ignored the wishes of his shaman. The importance of the Silver Fang shamans has resulted in a lot of friction between them and other tribes. These shamans believe that no one speaks for Gaia more than they do, and the other tribes frequently take offence to that. In particular, the Shadow Lords and Glasswalkers are scornful that the so-called leaders of the Garou are guided by starry-eyed half-crazed mystics, the more conservative Get of Fenris are offended by this devotion to male seers (when the Get traditionally believe that theurges should be female), and the Uktena are insulted that the Silver Fang claim that their shamanic wisdom is superior to all others. Many Silver Fangs are offended in turn that many Garou of Siberian and Mongolian descent are now part of the Uktena tribe instead of the Silver Fangs. They accuse the Uktena from “robbing” from their people, not recognizing the irony in such an accusation. Their main totem is Eagle, with Falcon as a secondary one. These birds are commonly featured on Silver Fang iconography, and falconry has always been an important part of their culture. They use birds of prey for hunting, combat, to deliver messages, and simply to stand there as symbols of nobility (no Silver Fang would be so profane as to call an eagle a “pet”) Indeed, Silver Fang leaders still frequently have a trained eagle perched on their wrist or the back of their throne. Many believe the totem is there to represent their nobility and warlike spirit, and indeed that’s part of it, but it is even more significant to their shamans than to their chiefs. The eagle represents the shaman’s ability to fly through the Umbra, into the presence of Gaia, and also Gaia’s ability to send her herald to the shaman and whisper in his ear while he sleeps. Warfare, nobility, breeding, and shamanic wisdom – the Eagle embodies all that the Silver Fangs value. Lineage is incredibly important to the Fangs. After all, their great claim for rulership of the Garou is being descended from the First Shaman. Thus, they care very strongly about their lineages, both their actual bloodlines and the previous people they replace. For example, when a shaman dies, his disciple will frequently make a necklace from his bones to wear in his honour, and to show that the previous shaman lives on in him. Many other Garou claim that this obsession with lineage is why so many Silver Fangs seem to be suffer from madness. The Silver Fangs loudly dispute this, instead claiming that the reason for the madness is because their ancestor was kissed by the Goddess. The force of her presence shaking up their perception of the universe is a sign of her blessing. Indeed, often the insane Silver Fangs are chosen to be shamans, something else that the Shadow Lords and Glasswalkers take great offence to. I always liked Anaconda of the Serpent Society because she has such a different body type from like 90% of all superhero comic book women. What makes it especially interesting was that, in all the comics with Anaconda I read, her body type wasn’t a defining part of her character. Usually if a woman is large in the comics, that’s the main thing about her, and often either a point of tragedy (such as the She-Thing), humour (Big Bertha), or both (Gamma-Burn). But Anaconda’s gimmick isn’t that she’s big — it’s that she can stretch her arms and use them to squeeze the life out of Captain America. She just also happens to be a big girl. Which is cool. I think she dated Rock Python for a while.